Bay Creek Pelican Landing Homes: An immediate sense of grandeur is created by this custom estate home from the moment you enter on to the circular driveway with the park like setting where you will experience paradise living at its best. Privacy and tranquility are captured in this stately home with the lush landscaping. This custom home was designed for livability with family and friends to enjoy the Florida lifestyle. Quality features and an innovative floor plan appeals to a Buyer who wants to express their own individual style. The alluring lanai and pool area, complete with outdoor kitchen, are perfect for entertaining and glorious sunsets. There are so many highlights of this home evoking charm everywhere you look it has certainly proven to be the talk of the neighborhood and the perfect choice for your family. Pennyroyal Pelican Landing Homes: H.13885 - Beautifully situated on one and a half acres, this elegant home enjoys unparalleled lake and golf course views of hole #5 of the Pelican's Nest golf course. Recently and extensively updated, the home offers a gourmet kitchen featuring double ovens, gas stove, granite counters and wood cabinetry, updated bathrooms, plush carpet, ceramic tile and wood flooring, remodeled pool/spa including the pool deck and new pool cage, solar and gas pool heating, two new air conditioners and hurricane rated windows and doors. The main floor master suite is expansive with a spacious bathroom and walk-in closet. A new main floor guest wing, added in 2014 and did complete new roof for whole house at same time, offers two bedrooms, one and a half baths with additional laundry area. Enjoy expansive golf and lake views from the second floor guest bedroom and sun deck. Enjoy the view and beautiful Florida weather from the gazebo in your backyard. Pennyroyal Pelican Landing Homes: Welcome to paradise in this beautifully appointed home in Pelican Landing. Enter through the double glass front doors to the large open living room with double tray ceilings and uplighting. Enjoy the sweeping lake view over the infinity edge designer pool through the disappearing edge double sliding glass doors. The oversized kitchen opens to the den and also boasts a large bar height countertop and center kitchen island with upgraded designer kitchen cabinets and appliances throughout. The master suite is designed to take in the view through double glass doors, and the master bath includes a large master shower, built in soaking tub, "his and hers" double sinks and vanity. In the office, you will find a custom designed built in desk set and matching hardwood floors. Step outside and you will take in the stunning long lake view from your oversized Lanai which includes a built in outdoor kitchen, infinity edge designer pool and hot tub and customized landscaping bringing you that tropical Florida feeling. Longlake Pelican Landing Homes: H.14375 – From the moment you walk into this completely remodeled decorator home, you know it feels like home! Enter this spectacular 4 bedroom + den, 3.5 bath single family home through the new impact glass and wrought-iron custom door into the formal, yet comfortable living/dining area. Enjoy the large custom kitchen and family room with the new electric fireplace. Plunge into the large saltwater pool with elevated spa, overlooking Pelican Landing’s vast lake and quiet preserve area and catch brilliant sunsets from your expansive lanai. Enjoy your new master suite complete with remodeled bathroom that offers an oversized jetted soaking tub and a walk-in shower. Your guests and family will enjoy the private guest bedrooms with beautifully updated bathrooms. Among the many extraordinary features of this home are hurricane protection throughout, whole house standby propane-powered generator, beautiful hardwood floors, custom master closet cabinetry, an oversized side-load 2 car garage, and so much more. In order to fully appreciate this home, we invite you to take a look for yourself! Bay Creek Pelican Landing Homes: A lifestyle to treasure... in a jewel of a home. This 4,920+ square foot gem was custom-built in the exclusive community of Bay Creek within the prestigious Pelican Landing. Bordered on the south by Spring Creek and on the west by Estero Bay, Pelican Landing is a 2,365-acre masterpiece of winding roads and enchanting foliage, graced by aquatic abundance, intriguing wildlife, and upscale elegance. This 5-bedroom home won't disappoint. An impressive lanai compliments the surrounding beauty with a natural rock pool, raised spa, mesmerizing waterfall, and in-pool seating to allow year-round enjoyment of the Gulf Coast climate. Community amenities include a beach park, butterfly garden, canoe and kayak park, fitness center, sailing center, tennis, and golf. Lakemont Pelican Landing Homes: Beautifully redesigned ranch home with the finest of finishes. Complete renovation, Kitchen (Bosch appliances), Baths, Flooring, Wet bar, the list goes on.... Roof replaced in 2018, Exterior completely painted, New wood flooring....Custom window coverings....Large over-sized private lot...generous 2 car side load garage. This home is current and ready for new homeowner. All of this added to the outstanding amenities of Pelican Landing, Private Beach, Tennis, Canoe and Kayak, Workout facilities, and a Butterfly Garden and...west of 41 with reasonable fees. Pelican Landing Homes: This is your opportunity to enjoy stunning Southwest Florida sunsets from your private lanai each and every day. This beautiful Pelican Landing home offers spectacular golf course and lake views. The expansive pool and hot tub are the focal point of this beautiful property. The open floor plan offers plenty of light through the tall windows across the back of the house. The property is perfectly positioned on an oversized lot offering extensive room between you and your neighbors. The Master suite is large and offers incredible features and natural light throughout. As you tour the split-bedroom floor plan, you will see that there is plenty of privacy for your guests, including a guest bedroom with an en suite bathroom. This Luxury home is situated on the Pelican's Nest Golf Club, with views of serene lakes, golf course, and natural preserves. Enjoy access to the community's private beach island. Don’t miss your opportunity to own this custom home. Pennyroyal Pelican Landing Homes: H.12842 - Spectacular lake and golf course views....Living is easy in this generously spacious residence with beautiful travertine marble floors that flow throughout the home's main living area. Entertain in grand style in rooms graced by 14' volume ceilings, decorative tile fireplace, wet bar w/ wine cooler and sunset views that will take your breath away. The renovated gourmet kitchen will inspire your inner chef with its granite counters, center island with breakfast bar, abundant cabinet storage space and stainless appliances. Disappearing sliding glass doors lead out to a sprawling outdoor living area with large private pool + spa. New roof installed 2015 and new AC + pool heater in 2014. Perfect for anyone...this home invites true resort-style living. If an elite lifestyle in an amenity rich community is for you.....we invite you to view this exclusive property. Pelican Landing Homes: Imaging yourself enjoying sunny mornings and breathtaking sunsets from this spacious custom built home, constructed by Arthur Ruthenberg. Built with attention to every detail, the home features 12 feet ceilings and plenty of room to live and entertain. Very practical floor plan with split living/bedroom quarters and plenty of natural light throughout the home. Paved patio, oversized pool, outdoor kitchen, pool bath, picture window screen to allow unobstructed view over lake and landscape. Ample space between neighbors with mature tropical and fruit trees. Upgrades include metal roof with 50 year warranty, cedar wood ceiling in the lanai, impact windows, extra large 3 car garage with high aluminum shelving, generator for the entire house, grey brick driveway and concrete walkway leading to the lanai doorway. Pelican Landing is an upscale community offering many great amenities such as a private Island Beach Club, two 18 Hole championship Golf Courses, 12 Tennis Courts, fitness facility, sailing center, kayak and canoe park and so much more. Plenty of restaurants, shopping, international airport are all just a short distance away. Longlake Pelican Landing Homes: This stunning view will take your breath away and will entice you to stay! More than 0.5 acre lot, West of 41 in a gated community and NOT in a Flood zone (per current Flood maps from Insurance) under 1 Million $! Only 3 other properties meet those criteria currently listed! The original Owner of this Arthur Rutenburg built Estate home on the over half acre lot took great care of the property! The 3 Bedroom + Den, 3 and 1/2 baths beauty is situated perfectly so you can enjoy a preserve and western Lake view with gorgeous sunsets! Solar an electric heat for the Pool, 2017 Bosch Washer and Dryer, 2013 Stainless steel kitchen appliances from Kitchen Aid , an Outdoor kitchen and Super screen on the lanai cage are just a few upgrades to point out! Pelican Landing has lots to Offer to its residents including a Beach Park, Bocce, Tennis, Sailing, Golf (for additional membership fee), Pickle ball, Fitness Center at the Community Center a Canoe/Kayak Park and lots of activities for all! The community is located West of 41, less than 1.5 miles to Coconut Point Mall and less than 1 mile to Lee Health Hospital! Call your favorite Realtor for a personal showing today and view the virtual Tour! Longlake Pelican Landing Homes: This custom home was designed for livability. The tranquil lake view and oversized lanai and pool area make relaxing a top priority. The impressive craftsmanship of this former Gulfcoast Homes model home was built with attention to details. The impressive craftsmanship, dynamic ceiling details, marble floors, three car garage are just a few of the many features. The open, airy and full of light floor plan with spacious family room, comfortable living room and on suite guest bedrooms are perfect for entertaining the extended family. Showcased throughout this home is a classic causal elegance, well appointed and stylish with all the comforts of today. Longlake Pelican Landing Homes: Located on a quiet cul-de-sac, this beautifully appointed home has been well maintained by the original owners and features 3 bedrooms, 3 bathrooms and a guest cabana with ensuite bathroom. The spacious light and bright interior with formal dining, living room and family room has a perfect flow for entertaining and family gatherings. The master suite has direct access to the lanai with his and her vanities in the master bath and a separate tub and shower. Recent improvements include wood flooring in living area and bedrooms, the kitchen has been updated with granite countertops and top of the line stainless steel appliances. Additional improvements include a new roof in 2010 and new A/C in 2017. One of the stunning features of this home is its panoramic views of the lake and fountains from the large lanai with pool, spa and outdoor kitchen. Pelican Landing offers the finest amenities including a private beach park, canoe park, tennis courts, fitness facility and a 36 hole Championship Golf Course. Goldcrest Pelican Landing Homes: This two story custom built Kingon estate home has over 3700 sq. ft. of living space plus an over-sized three car garage. Transom windows bring lots of natural light into this spacious home making it bright and airy throughout. The home has four bedrooms, a den, three full baths and two half baths. Newer roof (2015), granite counter-tops, vaulted ceilings, and 20” porcelain tile throughout the main living areas are just some of the many great features of this stately home. The nicely laid out kitchen has newer stainless steel appliances, custom back splash, and ample cabinetry. The spacious screened in lanai has a full summer kitchen, a pool and spa, pool bath, ceiling fans and cobblestone tile. The large and beautiful estate lot has fruit trees and lots of room to garden and backs up to the golf course. This is the perfect home for hosting the family and entertaining your friends. Enjoy the great Pelican Landing lifestyle. Amenities include a private beach island, a sailing club, a canoe and kayak park, miles of sidewalk to walk, a fitness center and many social activities. Membership to The Pelican Nest Golf and Country Club is optional. Lakemont Pelican Landing Homes: This beautifully updated and meticulously enhanced Arthur Rutenberg home has 2900 sq. ft. of living space on one level that includes 4 bedrooms, 3 full baths. Living room, dining room and family room with wood-burning fireplace all opening to the large lanai and pool with a full outdoor kitchen. Rich wood doors welcome guests to an open floor plan. New roof (2019).The custom-designed Kingon kitchen is a stunner. Anderson wood floors throughout the living areas, professional landscaping and exterior lighting set this home apart. The over-sized garage has epoxy floor and great storage. Community amenities include 12 Har-tru tennis courts, bocce, pickleball, workout center, sailing club, 34-acre private beach with 10-minute water taxi, butterfly garden and more! Golf Memberships are available at Pelican's Nest, the member-owned Club boasting two 18-hole courses designed by Tom Fazio. Pelican Landing is surrounded by fine dining and upscale shopping to casual choices for both. 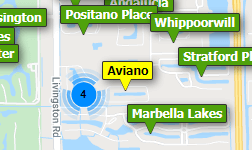 Five minutes north to Coconut Point Mall and 20 min. South is 5th Ave. Naples. A convenient 20 minute drive from SWF International Airport and you are here! Welcome to Sandy Beaches and Sunshine! Bay Cedar Pelican Landing Homes: One of a kind offering with Boat Dock and Gulf Access off of Spring Creek! Over 75' of tranquil panoramic Creek views come with this 3 bedrooms, 2 bath home with 2 car garage and heated pool. You will love the convenience of taking a Sunset cruise anytime you want or taking your kayak out early in the morning or having fresh fish for dinner? The possibilities are endless. From the moment you walk in you will love the vaulted ceilings, open floor plan with 20" tumbled marble flooring though out living areas. The owner removed the closet doors in Middle bedroom and installed a built-in desk, easily removed and refitted as closet. Luxurious Master suite has great creek views to greet you each morning, large walk in closet, his &her sinks, soaking tub and fully tiled walk in shower. The Kitchen is open to the Great Room area making it easy to enjoy company while creating meals. New roof 5 yrs old, A/C 5yrs old, pool refinished 2011, pool heater 2 mos. old. Fabulous bird life and Amazing sunsets are Priceless! furniture negotiable. Pelican Landing Homes: SUNSATIONAL SWEET GUM AT PELICAN LANDING!! Absolutely lovely home with unique architecture, fabulous Florida flare, stunning renovations, a sparkling and fully renovated lagoon style heated pool and some of the best long lake views in all of Pelican Landing. Inside you will find a light and bright floor plan, tall soaring ceilings, a lovely formal living room, an open concept family room and kitchen combination, a fully renovated master suite, fully upgraded guest rooms and baths and much more. This home also provides the very best in Florida outdoor living featuring a large inviting front porch, huge covered and screened rear lanai, newly renovated lagoon-inspired jewel colored pool, gorgeous long lake views with multiple fountains and fully landscaped lawn with lush native tropical foliage. ALSO NEW ROOF 2015!! Pelican Landing offers a peaceful setting with bountiful native landscape and greenspace, private beach with complimentary boat shuttle, kayak park, har tru tennis courts, professional fitness center, pickle ball, monthly social calendar, sail boating, opportunity to join the golf club and much more. Call for your private showing today of this truly unique opportunity! Lakemont Pelican Landing Homes: Freshly Painted and Meticulously Maintained Courtyard Home on an Oversized Corner Lot in Lakemont, a Beautiful Enclave within Pelican Landing. This Home has been Tastefully Remodeled, Loaded with Upgrades, and is Ready for You! The Main House offers an Open Floor-Plan with 3 Bedrooms & 2 Baths. The Pool-Side Cabana is Charming with one Bedroom, a Morning Kitchen & a Large Bath. So well appointed with valuable Upgrades Galore including a Gourmet Kitchen which was thoughtfully Prepped for Gas Connection to the Cooktop if the new owner prefers, Fisher Paykel Dishwasher Drawers, Butlers Pantry, Pot Filler, Reverse Osmosis System and Tons of Cabinetry. A Refrigerated 650 bottle wine cellar is adorned with Onyx Countertops and Onyx Floors with an Impressive Etched Glass Entry. Other Valuable Upgrades include a 45kw Whole Home Gas Generator, 500 Gallon Propane Tank, 2 Tankless Gas Water Heaters, 19 seer Trane 4 zone AC system & a Heated Pool/Spa System Remotely Controlled by your Phone. The Furnishings are Tasteful and Negotiable. Pelican Landing is an Exclusive Neighborhood offering 2 Golf Courses, Tennis Courts, Restaurants & a Private Beach Island. Agents- plz see confidential remarks! Cottages At Pelican Landing Pelican Landing Homes: This much sought after, beautiful lake and golf course view 2-story home is located on a quiet cul-de-sac with unique tropical setting in The Cottages at Pelican Landing, a community providing low maintenance living. The home offers an oversized lanai with southwestern exposure, a lushly landscaped pool and spa, 4 bedrooms 3 baths with a bright, open floor plan, electric awnings and more... Master bedroom suite and 1 guest bedroom are located on the 1st floor ***Roof Tile was replaced 4th Quarter of 2018*** Pelican Landing amenities include private beach island, canoe/kayak park, sailing club, 12 tennis courts, bocce ball, community fitness center, butterfly garden and much more! 36 holes of Championship Golf. Social & Golf Memberships are available but not mandatory! Pennyroyal Pelican Landing Homes: Masterful design and modern luxury are uniquely embodied in this 4 bed 3 bath 3316 Sq ft home. This home features a living and family room with high ceilings and Bamboo flooring throughout. Open kitchen with solid surface counters and stainless steel appliances. Large master bedroom overlooking your pool. Spacious living which leads you to the covered lanai with your own private pool! This Luxury home is situated on the Pelican's Nest Golf Club, with views of serene lakes, golf course, and natural preserves. Enjoy access to the communities private beach island. This home is a must see located on the exclusive Pelican Landing a premier residential community in Bonita Springs. Longlake Pelican Landing Homes: H.13608 - Imagine sitting on your private lanai, gazing over the sparkling pool, making relaxation your top priority. This 3 bedroom, 2 ½ bath , plus den immaculate home, with soaring ceilings, open floor plan, is designed for comfort, convenience and perfect for entertaining. The home has a formal living and dining room as well as an open, spacious gourmet kitchen with Viking appliances, which overlooks the bright family room enhancing your everyday enjoyment. The two comfortable guest bedrooms are perfect for entertaining extended family and friends. The large Master suite features his/hers walk-in closets, updated oversized bath with a walk-in shower, separate vanities and a generous sized tub to relax in. Pelican Landing is an amenity rich gated community offering extensive variety of amenities such as a 34 acre island beach part accessible by a community boat shuttle, state of the art fitness center, bocce ball, championship tennis facility, pickle ball, canoe/kayak parks, and more, all for a very low HOA fee. Season is just around the corner, don’t miss your chance to view this one-of-a-kind property, and secure your special spot, in all that Southwest Florida has to offer! Lakemont Pelican Landing Homes: This spacious and immaculate pool and lake home is located in highly sought after Pelican Landing community nestled on a large beautifully landscaped lot. This home has a completely renovated formal living and dining room and a great family room for every day enjoyment. A beautiful kitchen with quartz counter tops and new custom 42” raised paneled cabinets with crown molding and brand new SS appliances. The Master Suite is spacious including a large walk-in closet, a master bath with granite counter tops, dual sinks with a glass enclosed custom shower and a luxurious free standing tub. The home is newly painted and landscaping has been updated with new sod and trees . Pelican Landing has fantastic amenities including tennis, bocce, pickle ball, sailing club, private beach and water taxi to take you over. Memberships available for the award winning Tom Fazio- designed 36 hole golf course. Need professional assistance selling your property at Pelican Landing Bonita Springs? Find out how an Area Specialist can help to generate more property exposure in order to get the most money for your investment in the least amount of time.